When I was jotting down must-see places for my Japan trip, Mt. 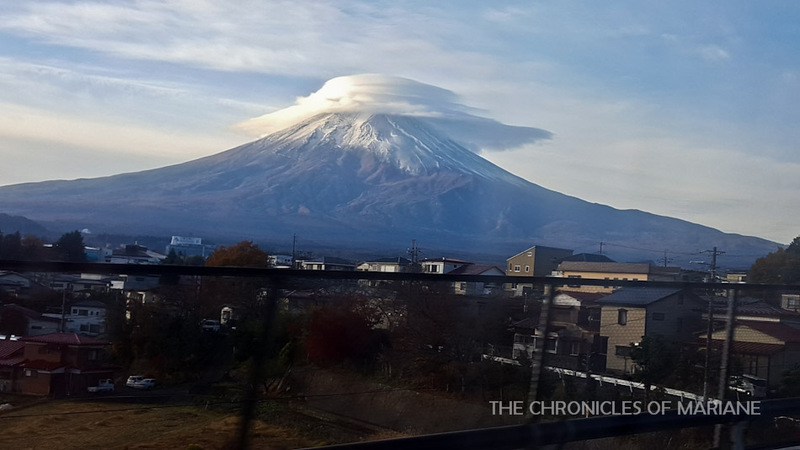 Fuji garnered the top spot. The next question that I asked myself was if I wanted to do the hike or see the mountain from afar. The hiking trail closes as early as September so going up was impossible. 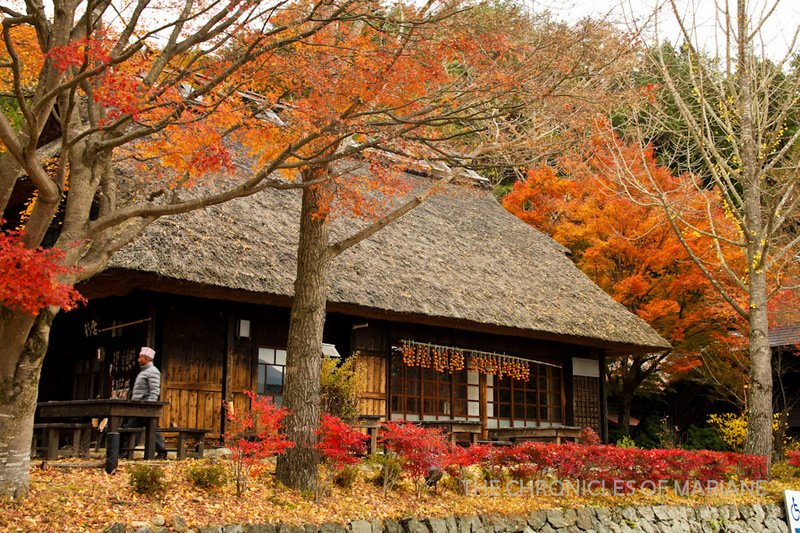 Budget also restrains me to stay longer – autumn is tourist peak season so lodging prices might be a bit steep. Eventually, I just opted for the more practical option, which for me was to do a day trip. 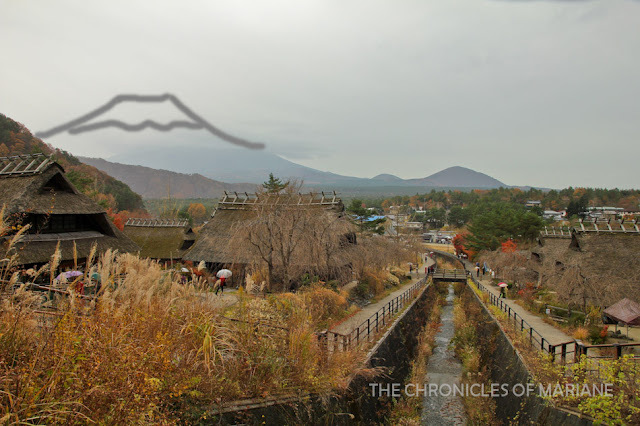 My choices were then narrowed down between Hakone, a destination famed for its hot springs with majestic views overlooking Fuji, or Fujigoko, which in English is the Fuji Five Lakes. I didn’t need to think much before deciding that the lakes is where I will spend my sixth day in Japan. Standing tall at 3,776 meters, Mount Fuji is Japan’s highest mountain. It is also considered as sacred, regarded as “Sanreizan” or Three Holy Mountains together with Mount Haku and Mount Tate. Its recent eruption was in 1707 making it as a dormant stratovolcano. For years and years, it has inspired artists with its perfectly formed cone and the beautiful landscapes that surrounds its area. On that note, the five lakes of Fuji of Yamanashi Prefecture that sit at the northern base of the mountain is said to be formed due to eruption many years ago. Over the years, it has become a popular resort area for its hiking trails, fishing spots, hot springs, museums and an amusement park. For independent travelers, you can go by train or by bus. Through the JR Chuo Line, make your way to Otsuki Station and transfer to the Fujikyu Railway Line until Kawaguchiko Station, the latter though is not covered by the Japan Rail Pass. One-way trip may cost around 2500 to 3500 yen. I chose to go with the slightly cheaper option which was by bus. Several companies serve this route like Fujikyu, Keio and JR departing from Shinjuku, Tokyo or Shibuya Station. One-way bus fare is about 1750 to 2000 yen. I had the idea of getting a budget pass when I saw it mentioned at Japan-guide’s page, however, there was only minimal information about it. This webpage has more details about the Fujigoko Enjoy Ticket (kippu in Japanese) which was sold for 4,350 yen. I got a good deal from this pass since it already covers two-way bus fare from Shinjuku to Kawaguchiko Bus Terminal (you can also alight at Yamanakako Terminal), as well as a choice of bus pass with either Fujikko bus or the omni bus. 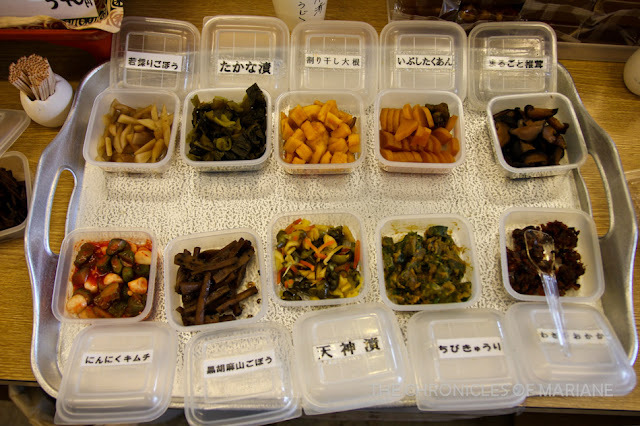 There are also some discounts offered in restaurants/shops/onsen which I was not able to use. Caveat, you need to reserve the bus trip from Shinjuku as it tends to get packed, in my case, I wanted to book for a weekend trip but I was told there were no seats available. This can be bought at Shinjuku Expressway Bus Terminal in front of Shinjuku Station. If you don’t want to be restricted by time, renting a car is one good option but for folks like me who cannot drive, there are several bus lines that go around the lakes. 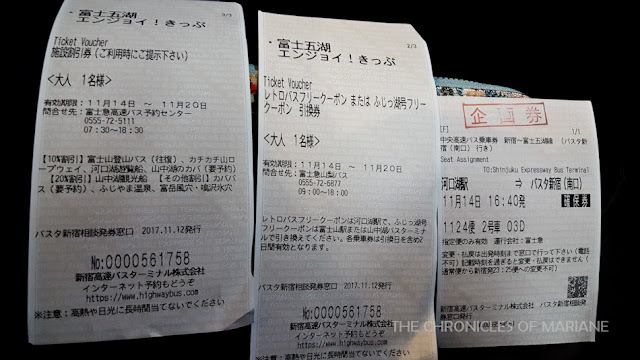 Included in the package is one bus pass so I took the retro bus with a two-day ticket that originally costs 1500 yen covering three routes: the red line takes you along Lake Saiko, the green one covers area along the south of Kawaguchiko, and the blue one goes as far as Lake Shojiko and Motosuko. 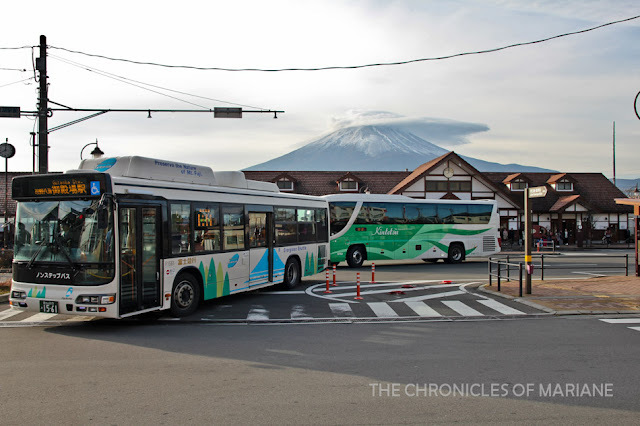 The other option is the Fujikko bus connecting Kawaguchiko to Yamanakako and OshinoHakkai. 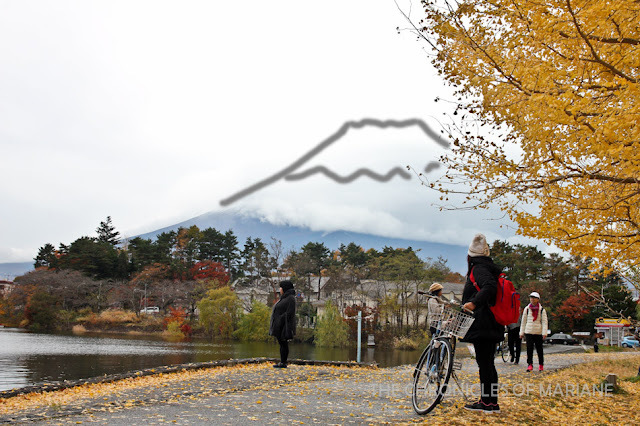 There is also another pass not included in the Enjoy ticket called the Mount Fuji World Heritage Loop Bus costing 1030 yen which takes you to the picture-perfect Chureito Pagoda. I suggest looking at the bus maps first before choosing which one fits your itinerary. I have a hot tip for you, dear readers. Before making trip arrangements, please check out the weather forecast to at least avoid seeing dark skies. Do not be like me who was all optimistic, and in the end, I never saw Mt. Fuji bare without any clouds by its side. One of the prettiest #manhole covers I have ever seen is from Kawaguchiko. Aside from being the only picture I have of Mt Fuji without any clouds 😯, it is also one of the few that has colors. I have collected about 45+ unique manhole pictures during my one-month trip. So many cool finds in Japan! Like I said, the major attraction for me was the possibility of seeing Mt. Fuji among these wonderful lakes. Unfortunately, I was met with the worst weather during my stay here and it rained all day long. Thick clouds blanketed Mt. Fuji from the morning I arrived. The best view of I had of Fuji was inside the bus as we were approaching Yamanashi Prefecture and when we arrived at the Fuji-Q Highland bus stop. Thankfully, I never sleep during bus rides so I was able to fully savor this moment (not knowing that this was the best I would see of Mt. 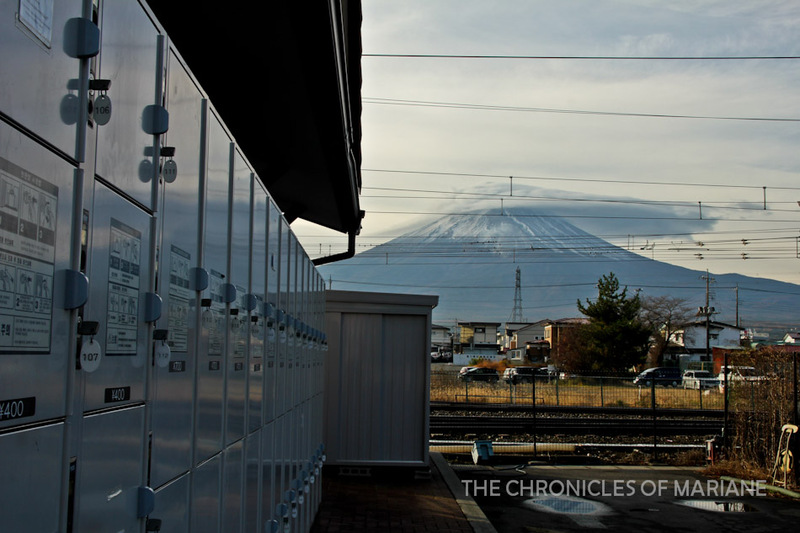 Fuji that day). 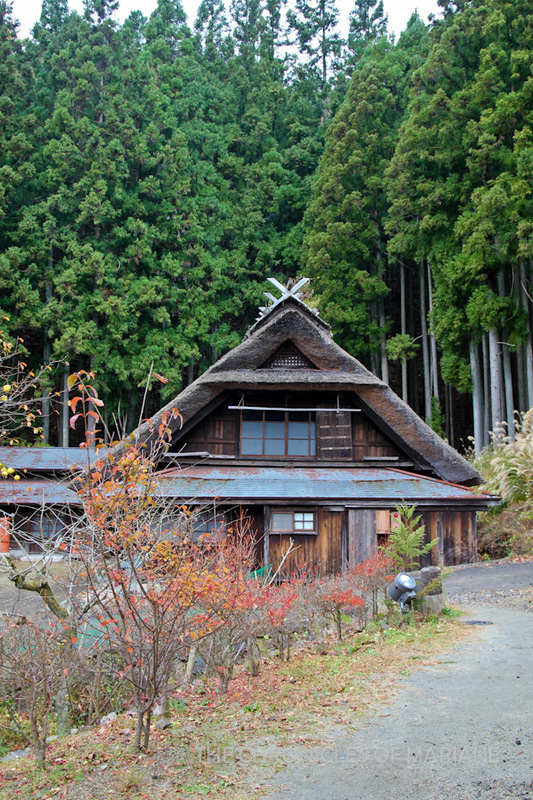 I was stumped when we finally arrived at Kawaguchiko Station, I was really looking forward to seeing Mt. Fuji on a clear day, but it was obviously not going to happen. Do I stay overnight even when my all my stuff is at Tokyo and postpone my plans to go to Takayama or just enjoy the day despite this major setback? 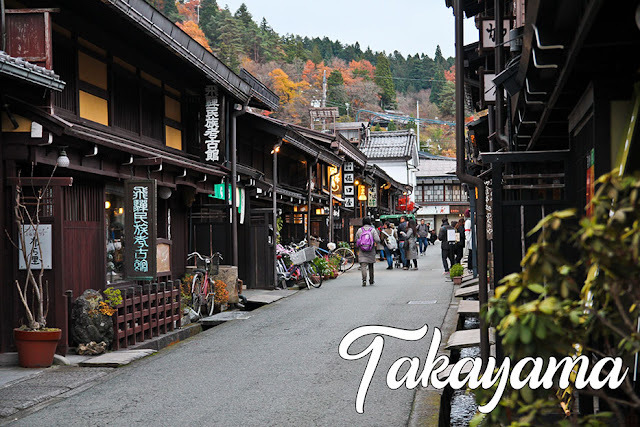 I put on a big smile and started exploring the area – I was in Japan for heaven’s sake! I shouldn’t be sulking or pouting but instead, just enjoy and go with the flow, right? As more clouds draw near Mt. Fuji, I thought it would be a good idea to go somewhere that is not usually on people’s itinerary when visiting the area. Iyashi no Sato was one of those places. The houses that we now see on this site is a reconstruction of thatched-roof homes since the former farming village that used to exist here was destructed by a landslide in 1966. These houses are now transformed as an open-air museum where you can learn about the story of the old village, farming life and traditional crafts like weaving and ceramic making. 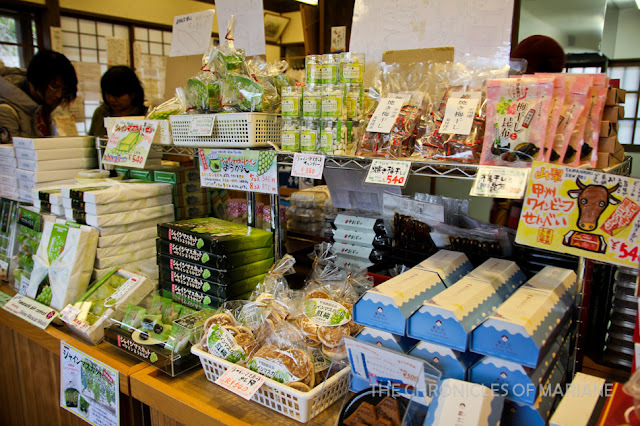 There were also some shops selling local products like snacks and souvenirs and restaurants. 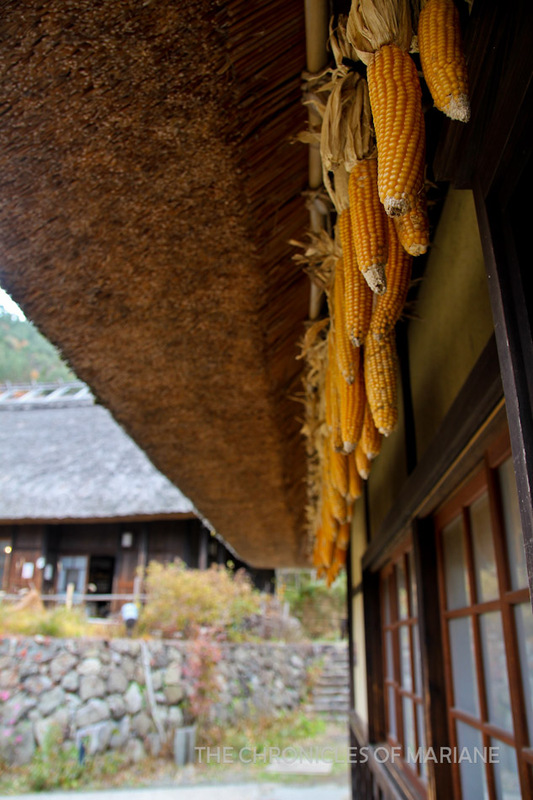 It was a pleasant walk along these traditional houses, I spent my entire morning sampling snacks, mingling with locals and trying my best to look for Mt. Fuji in the background. I have to admit it was a bit touristy with majority of the establishments built visiting tourists like rental kimono, but I didn’t mind at all as it was not crowded and still felt like a serene village. Similarly, there is also Oshino Hakkai, a traditional village that features eight ponds. 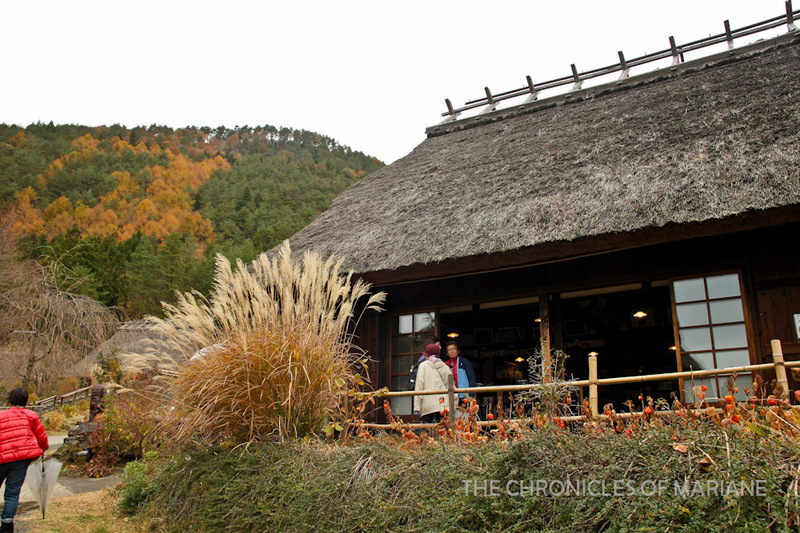 I recommend giving Iyashi no Sato a visit if you are around Fujigoko, especially if you have no time to see Shirakawago in Central Japan. I saw the rarely-visited Lake Sai on the bus map and thought that I might as well give it a visit. 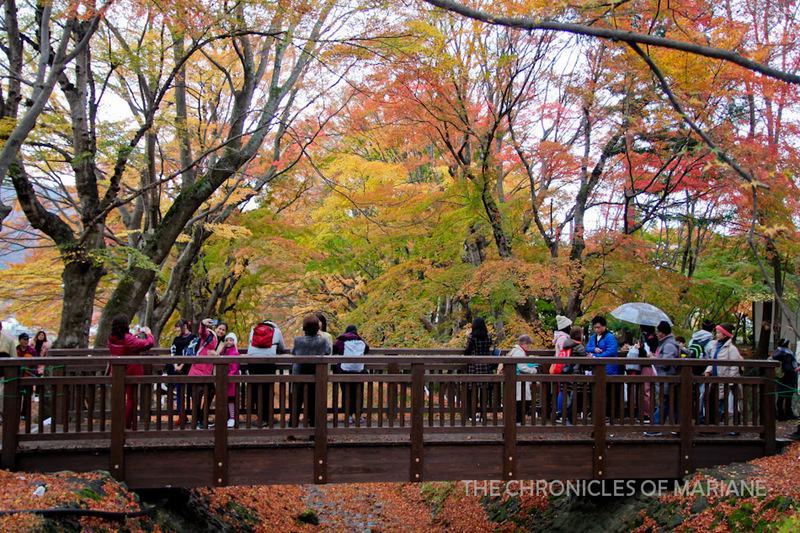 Despite the drizzle, it was still a nice experience with most of the leaves changing its colors and the tranquil scenery. I had the view all to myself which made it more special. I was told later on that just nearby Saiko is the infamous Aokigahara Jukai Forest or known for the many reports of suicide deaths in its premises. 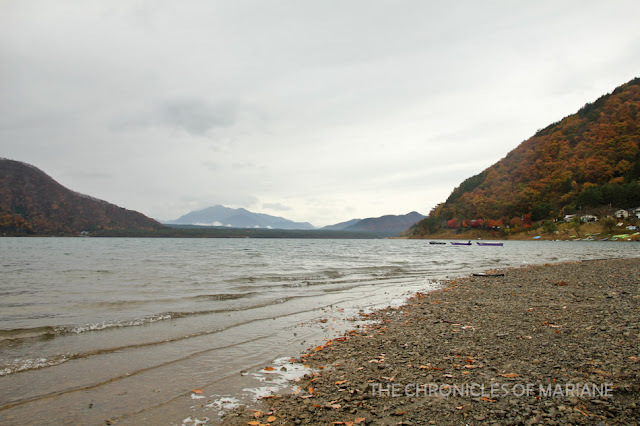 No visit to Fuji Five Lakes would be complete without seeing the largest one, Lake Kawaguchi. It is impossible to miss because this is where the main transport hub for Fujigoko is. 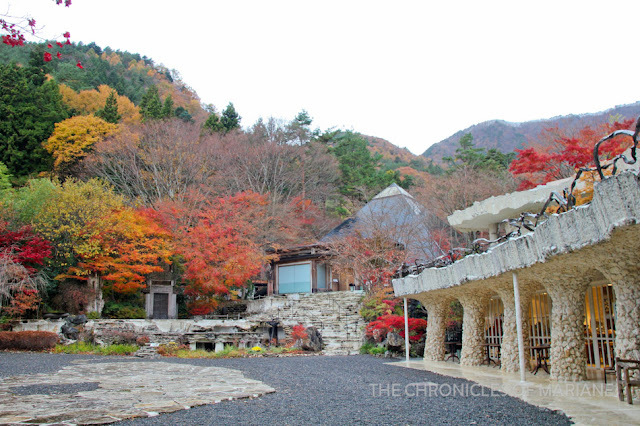 Many tourists also opt to stay the night in this area due to the abundance of ryokan and hotels. For a nice panoramic view of the lake, take the Kachi Kachi Ropeway in Mt. Tenjo. You would not be disappointed. It’s so hard not to stop for a while and enjoy this scenery! this could have been a lovely photo with a clear Mt. Fuji in the background, don't you agree? 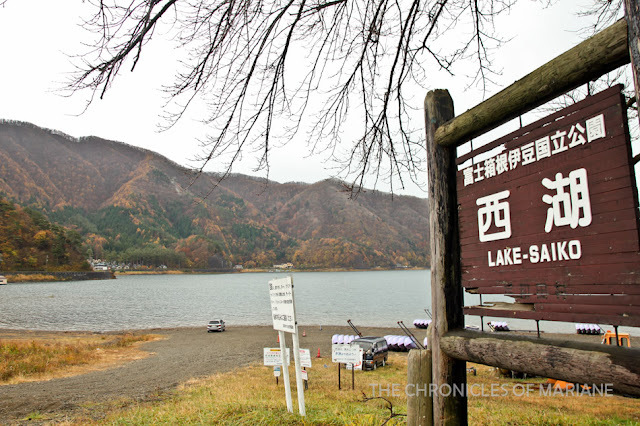 There is also Lake Motosu which is one among the top ten deepest lakes in the country, Lake Shoji known to be the smallest among the five lakes, and the largest Lake Yamanaka ranking third at the highest lake in Japan situated 980 meters above sea level. 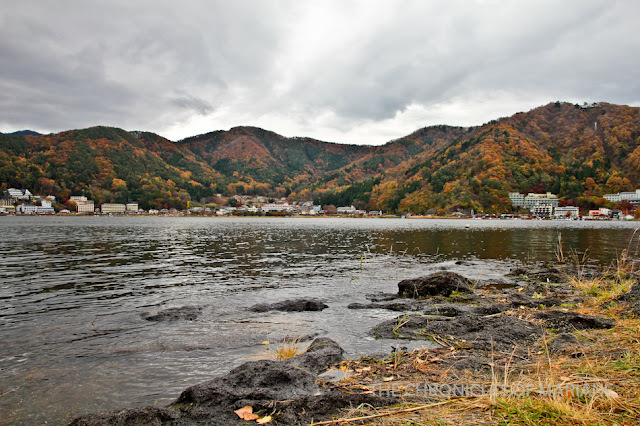 I spent a long time around Lake Kawaguchi because of these amazing golden things! 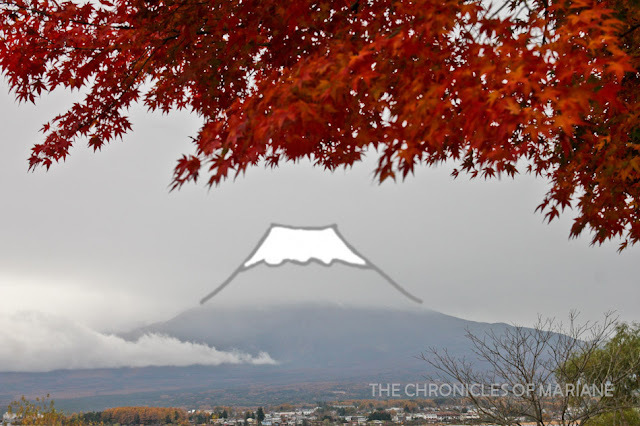 I hoped that the weather would clear up eventually, but it turned worse as the day progressed with sporadic rains and thick set clouds rolling in especially within the vicinity of Fuji. I resigned to the thought that I will never see Mt. Fuji in its full nakedness, so I decided to just explore what Fujigoko has in store. 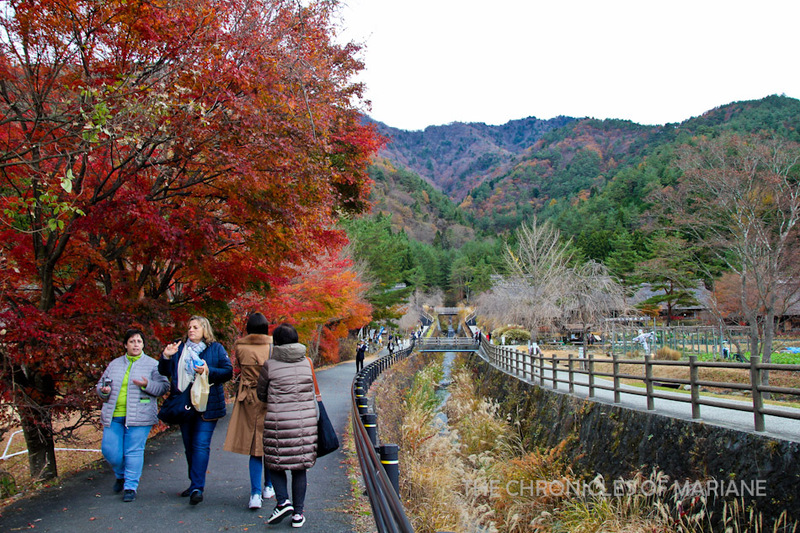 I had some time to see the Kawaguchiko Music Forest but on my way up, we encountered the heaviest traffic and also the craziest autumn colors! I got off at the nearest bus stop to see what the fuzz what about and turns out there is an autumn foliage festival in Kawaguchiko locally called Momiji matsuri. 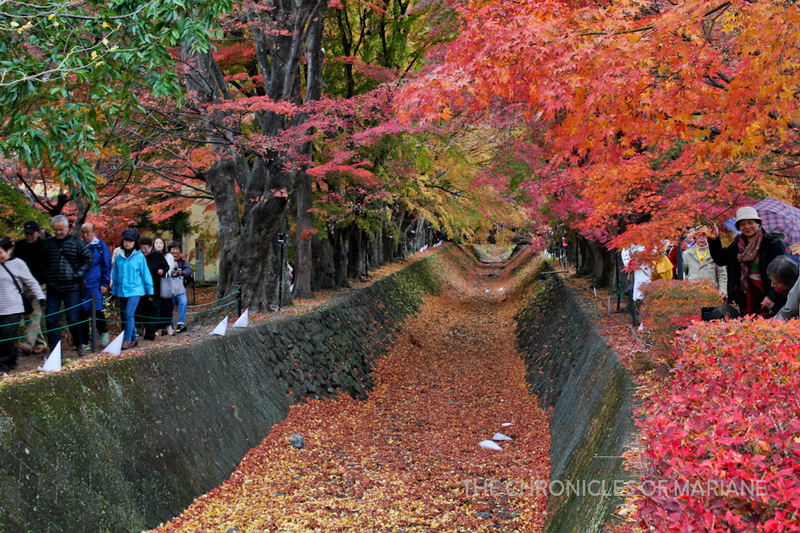 This lovely momiji tree tunnel provides you with the most spectacular combination of autumn hues – it was like looking at a crayon box with 64 colors in it. 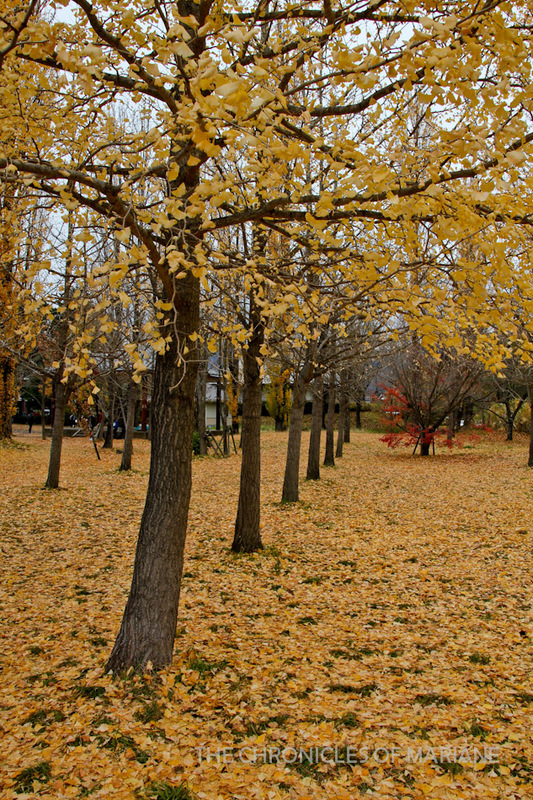 I couldn’t blame the flock of busy tourists taking pictures of the trees and of themselves because it was just truly a lovely scenery. I spent half an hour walking in this short, albeit enjoyable path. "Not even the rain is gonna stop us from taking pictures!" 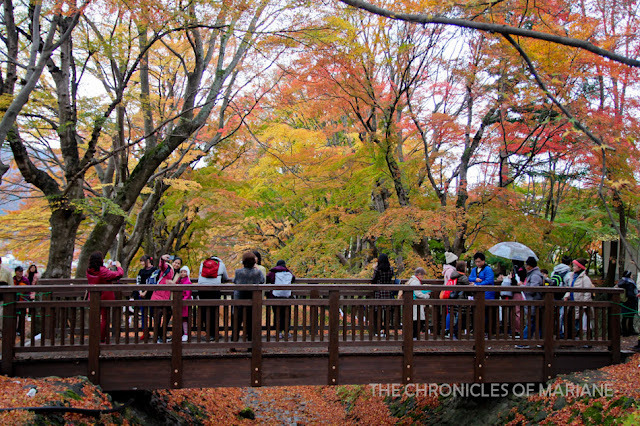 It was the Momiji Festival in Kawaguchiko a few days ago. Can you name all the colors present in this picture? As the rain got stronger, I decided to see some stalls selling local delicacies and the standard Japanese festival grub. 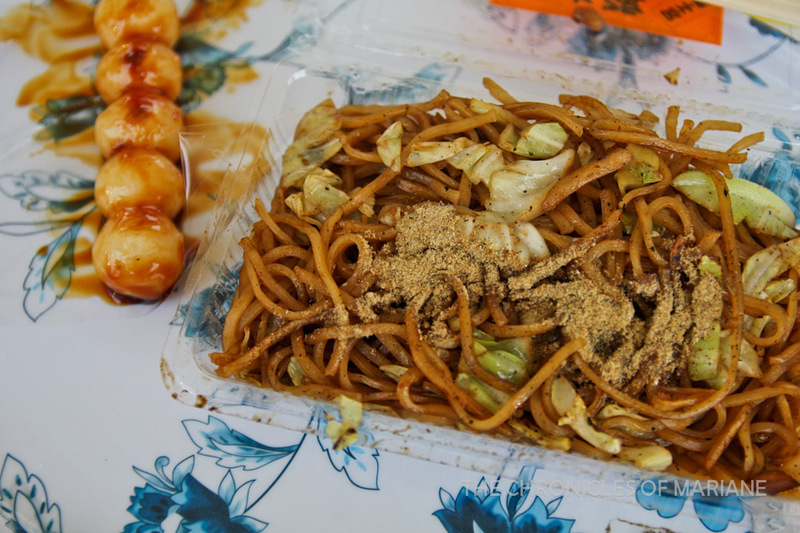 I have tried yakisoba in Manila but the authentic ones here in Japan tasted different, and I of course, preferred the latter. The perfect amount of saltiness and umami combined with crunchy cabbage was satisfying. I also had a mitarashi dango, which was a first for me. I prefer sweet dangos like the one I had in Kamakura previously, but this was not too bad but not a favorite of mine either. For dessert, I had dried green apples which I loved so much, I got one more pack to take home. It had the right amount of sweet and sourness – a perfect conclusion for this day trip. 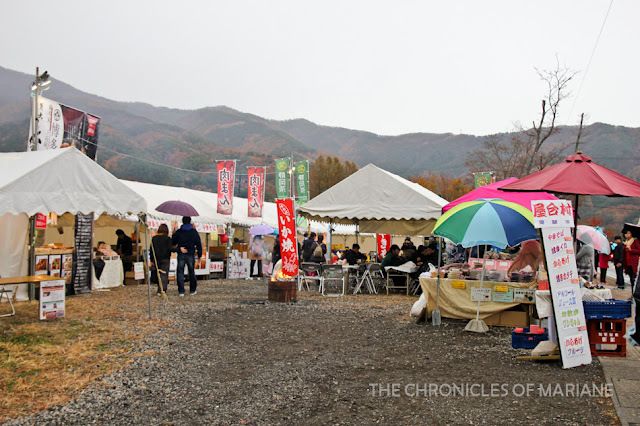 Other festival staples available were udon, takoyaki, okonomiyaki, hot dogs, burgers and fruit juices. Of course, I would have wanted to see Mt. Fuji but at least there was a 5-star experience in this trip – and it was this festival. I would have wanted to do more but not wearing proper rain gear was a big hassle and getting a bus back to Kawaguchiko turned out to be a challenge. Many people were starting to queue up and fewer buses were picking up passengers. In the end, I decided to walk to a farther bus stop where there were fewer people waiting so I was able to secure a seat inside. The bus got so jampacked afterwards which was a rare scene in Japan (to me, at least). In the end, the driver asked waiting passengers if they had booked bus tickets back to Tokyo so he can prioritize. Fujigoko has certainly more to offer that I was not able to explore. For one, the popular Fuji-Q Highland, an amusement park that prides an exciting roller coaster ride with an amazing view of Mt. Fuji. I wonder if I could enjoy the lovely vista while experiencing the turns, twists and loops of a roller coaster.. There is also the Chureito Pagoda that I skipped given the cloudy weather. This spot is probably one of the most photographed spots around the volcano that we often see in Japan travel brochures and websites. Despite having gloomy weather the entire day of my visit, I look forward to seeing Mt. Fuji again. But next time, I will plan carefully and consider staying in Kawaguchiko for two to three days. 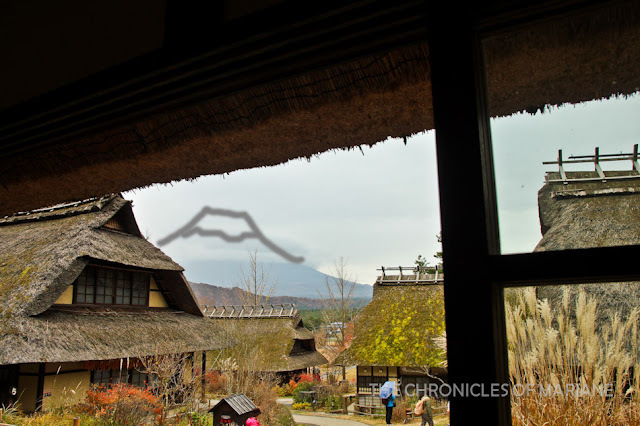 Maybe look for a nice ryokan with an amazing view of the mountain? 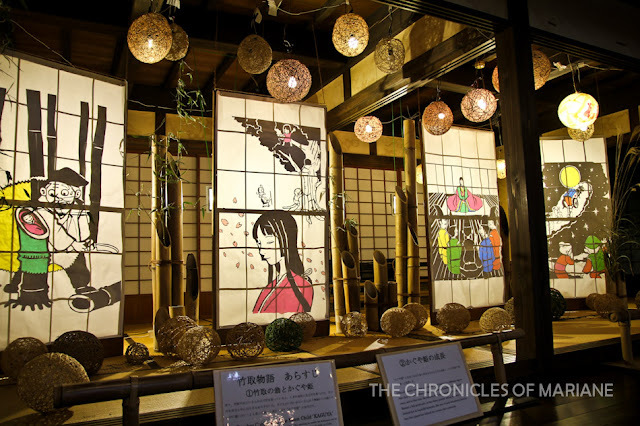 Or try to time it during the Shibazakura Festival during spring? For now, all I can do is wait for a cheap ticket sale to Japan. 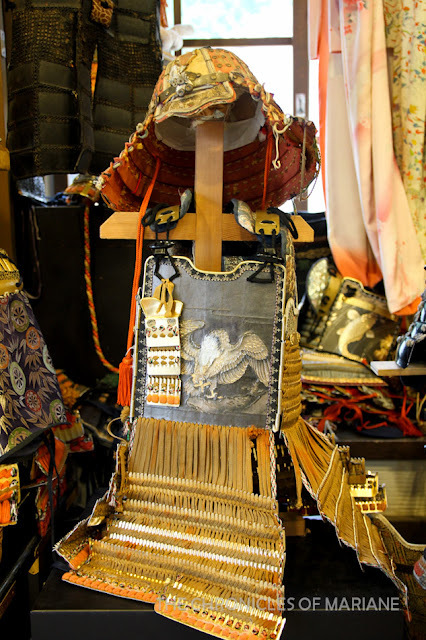 Follow my footsteps in Japan! I still have not been to Fuji :( Bookmarking this for when I go to Fuji in the future! Sayang the Mount Fuji would have been majestic. But nonetheless this is a very good guide to see Mt. Fuji... The live camera feed seems to be accurate. But the Autumn must have been the "bawi" - beautiful shots of Autumn. As for Mt. 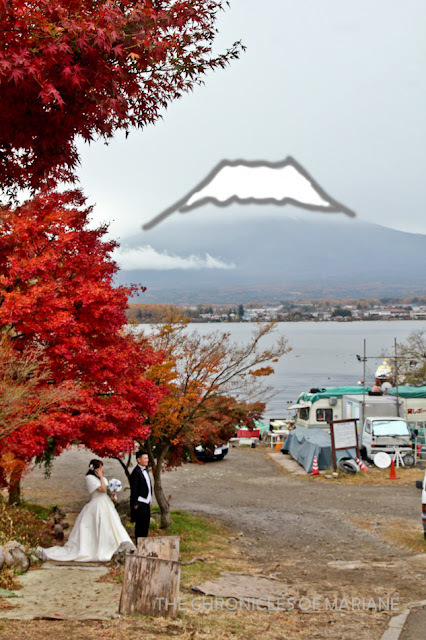 Fuji, there will be a next time. Could you tell me more about the Fujigoko Enjoy Ticket? How do you reserve the bus trip from Shinjuku? How far in advance do you need to do this or is this done when you buy the ticket? If you reserve in advance, do you need to bring anything when you buy the ticket? Thank you so much! I hope you get a clear view of Mt. Fuji next time you go!